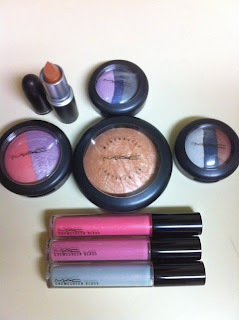 M.A.C COSMETICS In the Groove Haulage & Review! 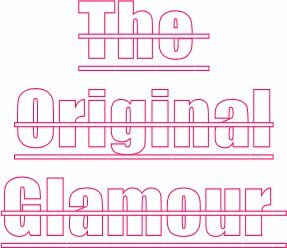 Hi ladies, So its been awhile since I've done a review..life & work has been so hectic! This collection is wonderful..a great assortment of fun colours,and mineralize products too. I got some awesome goodies that I've been dying to tell you about! Let me start by saying that I'm a complete mineralize junkie. I seriously think I need some skinfinish and blush intervention. I'm so happy they repromoted Stereo Rose,as everyone has been lemming that for centuries since its last release centuries ago. Sadly,it was sold out by the time I tried to get one..(teach ya to preorder,eh?) which was the same day of the launch! Anyway,I loved the mineralize trio eyeshadows. The unique thing about the new trios is they are not all shimmer.2 sides are more of a satin/matte finish and the middle is the one w/shimmer. I love using the middle stripe wet as an eyeliner..looks fab! I simply couldn't resist the urge for Hang Loose mineralize blush..pink and lavender...sign me up scotty! The pink side is a nice satin finish with subtle shimmer and the lavender is a beautiful highlighter. You can't forget By Candlelight..a soft golden pink highlighter,a tad bit warmer than Porcelain pink mineralize skinfinish..gives you a gorgeous glow from within. My favorite part of the collection though,had to be the Cremesheen Glass. I thought Chillin' would be scary..like who would wear a blue lip gloss,realistically? Much to my surprise,its fabulous! Its almost white-clear with a soft pink iridescence. Right Image is a gorgeous pink,great to layer on top of Viva Glam Gaga. Last but not least..Going casual..beautiful,soft lilac..looks amazing on top of Lavender Whip Cremesheen,paired with Hang Loose blush.